There is an often used adage that always comes to mind when talking about the Lone Star State. It’s the same slogan that’s stamped on t-shirts, oversized belt buckles and six pound steak challenges. And although it isn’t the state’s official motto, we wanted to test it as the Transitions/VSP Success is in Sight Tour took Bess the Book Bus deep into the heart of Texas. First glance at the lay of the land made the saying seem like an exaggeration. Small cities were spread thinly between cornfields and cow pastures. The scenery stayed the same for the first four hours. Suddenly, the low-lying horizon was interrupted by a fast rising skyline. Interstate 10 rolls west into Houston where the road grew five lanes wide and overpasses stacked three tiers high. It’s true what they say, everything is bigger in Texas. The sun was still shining as we crossed the Harbor Bridge into to Corpus Christi. Our ambitions matched our altitude at 243 feet. From there, we could see the big things on the horizon. Help from our sponsors at Transitions/VSP, Citgo Fueling Good and Townsend Press promised to boost the next five school visits to some of the biggest in Bess the Book Bus history. We arrived at George Evans Elementary early Thursday morning and were greeted by ambassadors from Citgo. They came with boxes and boxes of brand new books in tow. The local refinery has been embracing the Fueling Good spirit held a book drive. More than 400 books were collected, which helped replenish our shelves after events in Alabama and Mississippi. We followed the folks from Citgo to the next event at Oak Park Elementary School and gave away another 200 books. The good deeds and good reads, however, were only an opening act for the headlines in Houston. A few days before the Success is in Sight tour started, Jennifer received a startling call from the the Citgo Headquarters in Houston. They wanted to know what was the largest group of students she’s reached in a read along. Her previous record was set in 2010, when all 500 students of Bryant Elementary School sat for a special Dr. Seuss Day event. An event on that scale would hardly register on the Texas scale of feats. Citgo had something much bigger in mind. Plans were made to read to all of the kindergarteners in the Alief Independent School District. There are more than 3,500 kindergarteners spread through 100 classrooms in 20 schools across 34 miles. Getting that many children in one place and holding their attention during even the silliest of stories would blow past Texas’s special brand of big and right into the realm of gargantuan. 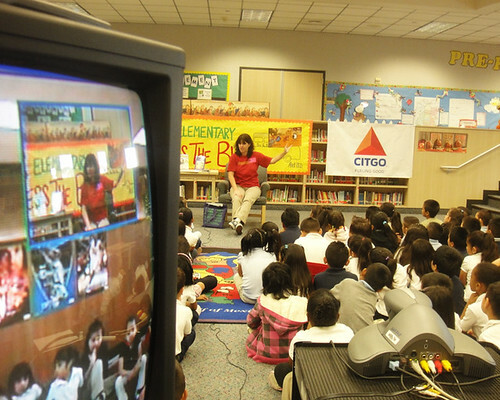 Arrangements were made to use AISD’s video conference capabilities to broadcast Jennifer’s read alongs into every kindergarten classroom across the district. Back-to-back performances were broadcasted from Collins and Hearne Elementary Schools. Thanks to Citgo employees and Townsend Press, more than 45,000 books were collected in Houston. Transitions/VSP also added to the spectacle by giving the gift of healthy sight. Three thousand vouchers for free eye exams and glasses were distributed through the schools to each of the students on free or reduced lunch. The value of Transitions/VSP’s contribution totaled $1.15 million! It was incredible to have such amazing sponsors get on board and give the students such amazing gifts. After the readings, Bess the Book Bus was invited back to the headquarters for an ice cream social celebrating Houston’s book drive. 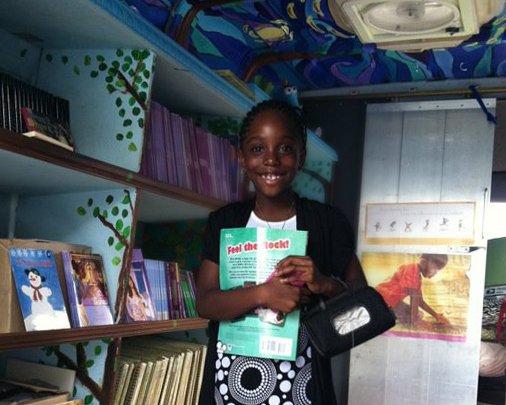 Employees donated more than 400 brand new books to Bess the Book Bus. Gustavo Valasquez, vice president of supply and marketing at Citgo, applauded everyone for their efforts, including Kate O’Brien who raised 72 books. The overall impact of our time in Texas was 4,870 books to 4,100 children. The trip continues next into Louisiana to visit Lake Charles and New Orleans. Keep up to date on the Success is in Sight Tour by following Bess the Book Bus on Facebook, Twitter, Flickr and <a href="http://www.youtube.com/bessthebookbusYouTube.